If you love being on the pulse of bourgeoning music, mark your calendar for Tuesday to Friday next week. Trans-Pecos, DIY baby from booker Todd P, and ground zero for avant-garde music off the L train, is transforming into a beat lair. 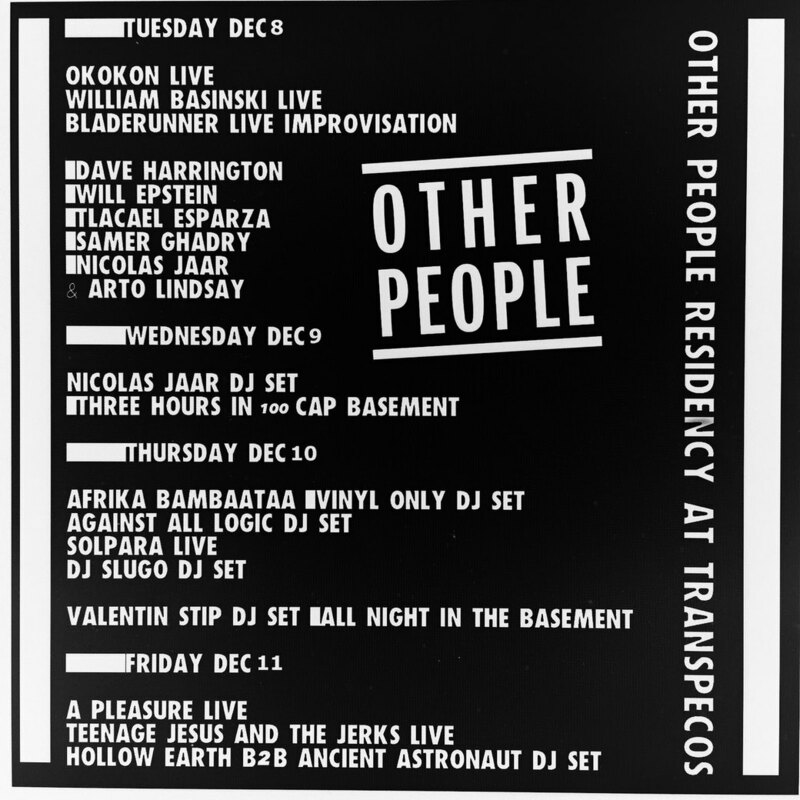 Nicolas Jaar, NY-based composer, electronic musician, and head of record label Other People, will be curating the space's sounds four days in a row. Having headlined the Brooklyn Electronic Music Festival in 2012 and more recently sold out Terminal 5 with his psychedelic electro group Darkside, Ridgewood is lucky to have him. Throughout four days, the lineup is stacked, showcasing both Trans-Pecos and Other People's shared focus on emerging experimental musicians from every genre while also shining light on classic, genre­-defining artists. All nights are an affordable $20 per ticket! Highlights include Bladerunner, a noise collaboration between Darkside members Jaar and Dave Harrington with Will Epstein (High Water), Tlacael Esparza (ARMS/Friend Roulette) and Samer Ghadry on Tuesday; Afrika Bambaataa's Vinyl-only DJ Set on Thursday; Teenage Jesus and the Jerks, a 1990s No Wave Band, on Friday. The icing on the cake? Jaar's own 3-hour DJ Set, attended by 100 lucky ticket winners to be "selected by a New York based Psychic." Check out the lineup below and good luck on getting those in-demand tix.